Every color has its own special attitude. Red is romantic, pink is feminine, white is pure, and yellow is cheerful. In these less than cheerful times, the upbeat and plucky spirit of yellow has become a popular wedding trend. Take a look at some of the beautiful ways to include cheerful yellow wedding flowers in your ceremony and reception. For a charming homespun wedding style, try combining yellow flowers with red and white accents. This is not the red of seduction, but rather the classic red of mittens, Radio Flyer wagons, and folk art. A bouquet of round yellow button shaped blossoms tied together with a red yarn bouquet wrap would be absolutely adorable. Decorate the handle of the bouquet with an eclectic assortment of colorful buttons to play up the handcrafted charm of the arrangement. For the reception, red and white patterned tins can be used as centerpiece vessels filled with informal yellow blossoms. What could be more cheerful than a daisy? 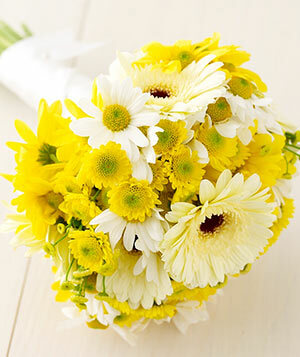 A bouquet of bright yellow gerbera daisies would be a fantastic addition to any informal wedding celebration. A simple round bouquet is perfect for these carefree blossoms. There are so many other wonderful things which can be done with yellow daisies. Suspend the round blossoms on ribbons to create vertical hangings behind an outdoor altar or the head table at the wedding reception. "Plant" the daisies in containers of wheat grass for fresh summer centerpieces or use them in a more minimalist fashion by lining the center of a long reception table with clear glass bud vases, each with one perfect yellow daisy in it. They are sure to bring a smile to the face of every guest. After the grayness of winter, bright yellow flowers are one of the favorite signs of spring. If your wedding is to take place during the spring months, fill it will sunny daffodils and tulips. They combine beautifully with fresh white blossoms to tone down the yellowness of the floral arrangements, or stick with all yellow for a super happy look. A great thing about both tulips and daffodils is that they come in a nice range of varieties, including ruffly parrot tulips, two tone tulips and daffodils, and delightful mini-daffodils. A mini-daffodil bouquet carried by a petite bride in a lace gown with pearl earrings would be a delightful sight indeed on a beautiful spring day. 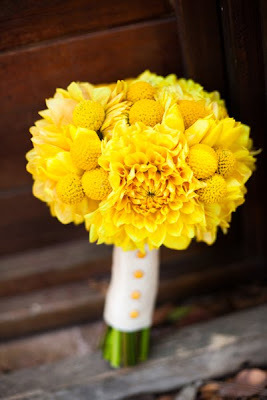 There are many other wonderful cheerful yellow flowers which are great for weddings. Choices include tall flowers like irises and gladioli, which are ideal for large altar arrangements, rustic mini-sunflowers which are just perfect for a late summer wedding, and harvest yellow mums and dahlias for a festive fall celebration. The upbeat color of yellow makes it a natural for an occasion as joyful as a wedding.